Car accidents can devastate victims both physically and financially. According to the Centers for Disease Control and Prevention (CDC), more than 32,000 people are killed and an additional 2 million are injured in motor vehicle accidents each year in the United States. While many of those injured in car accidents make a complete recovery with medical care, rehabilitative therapies, and time, others are left with permanent disabilities that will affect their physical and mental performance, as well as the ability to hold a job for the rest of their lives. However, those who were permanently disabled in accidents caused by another person’s negligence—such as someone who was driving recklessly, was distracted, or was driving drowsy or under the influence of drugs or alcohol—may be entitled to compensation for damages or qualify for Social Security disability benefits. If you were permanently disabled in a car accident that wasn't your fault, here's what you should know. Partial or total paralysis. Damage to the spinal cord can affect how the nerves transmit signals between the brain and various parts of the body, resulting in paralysis. The term paraplegia refers to paralysis that affects the lower extremities, while quadriplegia refers to paralysis affecting the torso and all four extremities. Vision or hearing loss. Damage to the eyes caused by glass or shrapnel, or a severe blow to the head, can cause permanent sensory impairments such as the loss of the ability to see or hear. Crushed limbs and amputations. When bones in an extremity are crushed, the limb may require amputation. Additionally, a permanently disabling injury may occur when a limb is amputated in the course of an accident and unable to be reattached. Traumatic brain injuries (TBIs). A mild head trauma can lead to a concussion, while a strong blow to the head or jolt to the body can leave crash victims with a moderate or severe TBI. These injuries can cause significant physical, mental, or behavioral deficits that can affect nearly every aspect of their daily life. Ongoing psychological trauma. The mental and emotional effects of a car accident can be long lasting. Some victims may develop debilitating or disabling anxiety, depression, or post-traumatic stress disorder (PTSD). 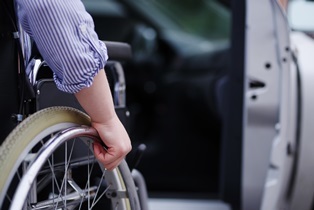 A permanent disability can impact the lives of accident victims in a number of ways. Unable to perform their job duties, they may be forced into a lower-paying position, and they may be unable to work at all. Additionally, accident victims with permanent disabilities often require expensive, ongoing medical care for the rest of their lives, and some may be unable to live outside a facility or without 24-hour assistance. Disabilities can also take a toll on victims’ relationships with their friends, family, and romantic partners. Permanently disabled accident victims who weren't responsible for the crash can file a personal injury lawsuit to seek compensation for past, current, and future medical costs related to the accident, as well as lost wages, loss of earning potential, and pain and suffering. Accident victims with disabilities that prevent them from securing gainful employment may be eligible for disability benefits through the Social Security Administration's (SSA’s) Social Security Disability Insurance (SSDI) or Supplemental Security Income (SSI) programs. If you were permanently disabled in a Georgia car accident, the knowledgeable car accident attorneys with Rechtman & Spevak can help you understand your rights and explore all your options for compensation. Contact our Atlanta law office today to schedule an appointment for a free initial consultation regarding your case.